Adapted from 19th Century Russian writer Nikolai Gogol's short story by screenwriter Waldo Salt, Taras Bulba is a reasonably accurate translation of the first half of the tale, although the time gap between Andrei's return from Kiev and their going to war seems to be much shortened and his ingress into the Polish fortress is very different, sadly though is completely misses out the interesting second half and thus its superb conclusion (perhaps a sequel was planned?). Filmed during the heyday of the Hollywood epic, it is a pretty conventionally formatted entry - beginning with some action, giving us the storyline (and a romance) and then building up to a climactic battle sequence. The storyline of forbidden love is nothing particularly novel, but it is made into the main focus of the film rather than just a subplot and so carries more conviction than in many similar films. The Cossack and Polish settings are quite unusual but are never quite exploited enough and the story feels like it could easily have been set in any Medieval European country – particularly the University scenes in Kiev (no mention is made at all of the clash between the Orthodox Christianity of the Cossacks and the Roman Catholic faith of the Polish). Director J. Lee Thompson gets plenty to play with and helms some epic sequences, the battle scenes are particularly impressive with cannon shot exploding among crowds of horses, he also makes particularly good use of matte paintings in a number of scenes, helping to back-up the good looking sets. The film is very much a product of its era, with colourful scenes and a generally family friendly tone. Unfortunately the film is sorely let down by the editing and post-production – many of the battle scenes are reduced to a comedy atmosphere by the ludicrous overuse of sped-up footage and there are frequent jarring splices of blue-screen shots to insert the main actors into a number of the sequences. Some very poor and again almost comically bad model work appears in a few scenes, most notably the climactic final battle which is also marred by sped up action. Composer Franz Waxman provides a typical epic soundtrack which suits the film well, although is not particularly suitable for the era or location and it is poorly used in a few places (again, in the final battle scenes). Yul Brynner takes the titual role and looks very well suited to it, with a heavy tan and a cossack scalp-lock - he looks every bit the coassack and the leader of a group of fighters. Tony Curtis had played in epics before, with Spartacus (1960) and The Vikings (1958) but still seems rather out of place here with his modern, New-York appearance simply not suiting the role particularly well, he does try very hard though and gives a strong performance. The particularly attractive Christine Kaufmann plays the love interest and would soon become Tony Curtis' real life love interest. 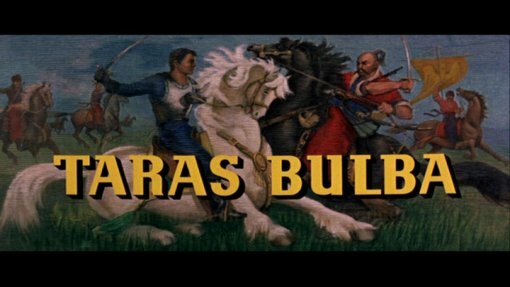 Yul Brynner and J. Lee Thompson do their best, but Taras Bulba never quite gels - whether it is the script that misses out a lot of interesting points, Tony Curtis' miscasting, or just the dire editing that makes the epic battle scenes into annoying paradies, it never really ranks above the mid-card of 1960s epics, but it remains enjoyable and fans of the genre or of Yul Brynner will enjoy this. Fans of the big 1960s epics and of Yul Brynner films will enjoy this, although it is not the best of either. The print is generally good with only mild speckling and grain. Other regions? Also available in the US from MGM - with French and Spanish audio. An enjoyable but sadly flawed epic, made watchable by Yul Brynner's typically fine performance. Of interest to genre fans. A perfectly decent looking and sounding print but if you want the French or Spanish, pick up the R1 disc. All text in this review written by Timothy Young - 30th September 2008.